The essential characteristic of shale gas is that the resource volume is often huge and the magnitude and effort required to extract it is correspondingly enormous. What attracts the fossil fuel companies is the same thing that alarms people living near the shale gas resource. It worries those of us who are concerned about dangerous climate change, as well. In 2013, the British Geological Survey (BGS) published an assessment on the gas resources of the Bowland Shale in northern England. They concluded that the median gas-in-place resource was 1329 trillion cubic feet. To put this in perspective, this is about 16 times the amount of gas produced from the UK North Sea over 50 years. The BGS did not estimate the recoverable gas resource, because they considered that the recovery factors are too uncertain to quantify. How much drilling would it take to exploit this resource? By July 2013, it had been estimated that 37,600 Gm3 (1329 Tft3) of gas-in-place existed in central Britain, although not all of this will be recoverable. By comparison, the total gas input to the UK transmission system in 2011 was 79.9 Gm3, meaning that the most recent estimate equates to about 470 years’ worth of shale gas supply. Later in the paper, they defined their central case for the Estimated Ultimate Recovery (EUR) per well as 1 billion cubic feet (Bcf). Simple division reveals that exploiting those huge resources would require 1,329,000 wells. 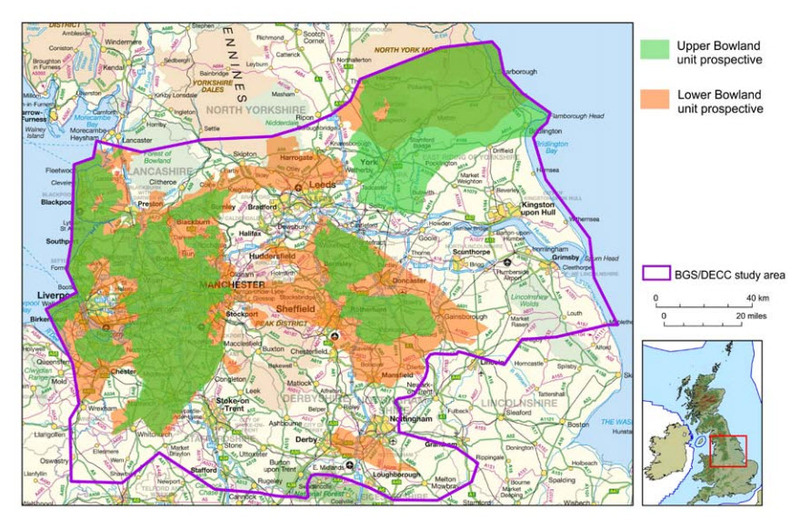 The prospective area for the Bowland Shale is shown in the map below. It encompasses the major conurbations of Liverpool, Manchester, Leeds and Sheffield as well as smaller but still substantial cities and towns like Chester, Blackpool, Preston, Blackburn, York, Doncaster and Derby. The orange and green prospective areas add up to (approximately) 19,000 square kilometres. The drilling density, using these figures, would be about 70 wells per square kilometre. Within a circle with a radius of one hour’s walk, let’s say about 4.5 km, there would be more than 4,000 gas wells. Despite John Lennon’s lyric, we are not about to see four thousand holes in Blackburn, Lancashire any day soon. It’s just a crude, order-of-magnitude estimate of the drilling effort it might take to exploit the full potential of the Bowland Shale. Not surprisingly, estimates like these are not generally given the same prominence as the claims that Britain has centuries of gas resources at its disposal. Producing the quantities of shale gas significant for Britain’s energy needs will require a huge amount of drilling. Britain currently consumes about 2.6 Tcf of gas every year (BP). To provide this amount of gas on a sustained annual basis would require, according to Stamford and Azapagic’s central case, about 2.600 wells per year, more than one hundred times the rate of onshore drilling in recent years. Currently, about 2,000 onshore wells have been drilled in Britain since the mid-nineteenth century. For Britain to be self-sufficient in gas, the total number of onshore wells that would have to be drilled every year is about equal to the historical total. According to a 2011 report by the Tyndall Centre, the shale gas company Cuadrilla foresees drilling 400 wells (for its middle development scenario) to produce 1.4 Tcf of gas over 26 years from its licence area near Blackpool. This is about 3.5 Bcf per well, much higher than Stanford and Azapic’s central EUR-per-well case of 1 Bcf. 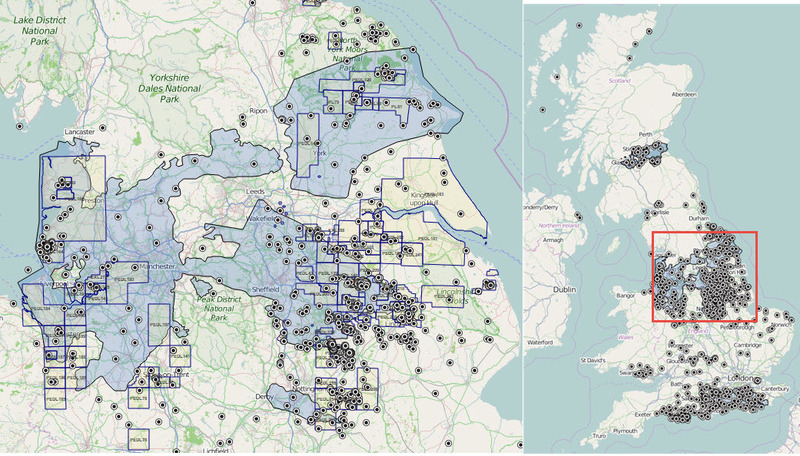 These 400 wells would contribute about 2% of Britain’s gas consumption (based on current rates) over this period. It would require around 50 concurrent projects the size of Cuadrilla’s for Britain to produce all of its gas needs from shale. Despite this, analogues with American experience show it may not be physically impossible for Britain’s shale gas production to grow this fast. For example, the Marcellus Shale in the NE USA now produces more than enough gas to fuel the UK and the production there has ramped up from very little over five years or so to today’s levels. It has taken over 100 drilling rigs to achieve this, however, with a total of about 8,000 wells in Pennsylvania alone. Promoters of shale gas in the UK like to talk about its potential to give Britain energy independence and, indeed, this production level is technically feasible should exploration and testing of the Bowland Shale be successful. But rarely do we hear about the huge drilling effort that it would take to achieve this. Rigorous regulation, restrictions from working in problem areas and careful operations might mean that only a small fraction of fracked wells turn out to have problems. But multiplying that fraction by the thousands of wells that might be drilled could result in several problem wells per year. Furthermore, all of this development work has to take place in one of the more densely populated regions in the world, so that any mishaps would affect more people than they would, for example, in the more sparsely populated areas of North America. Whenever we hear somebody tell us that shale will make a big contribution to the country’s gas production—or that it will provide energy security for centuries—we need to ask them how many wells it will take. Next, we turn to the biggest problem of all. Burning all of the Bowland Shale estimated gas-in-place would produce about 63 billion tonnes of carbon dioxide. From 1750 to 2010, Britain emitted about 74 billion tonnes of CO2, therefore exploiting all of the Bowland Shale gas would, by itself, roughly double Britain’s cumulative emissions. Although Britain now emits about half of the CO2 per capita that countries like the US, Canada and Australia do, Britain’s cumulative per capita contribution to climate change is the highest in the world (see Table 3 in Matthews et al, 2013) due to the country’s early industrialization. According to the latest IPCC Synthesis Report, the total remaining global carbon dioxide emission budget to give us a 66% chance of staying under 2 degrees is 1000 billion tonnes. The Bowland Shale gas could account for 6% of that budget. Quite clearly, a country with 1% of the world’s population and the biggest per person historical contribution to climate change cannot responsibly contemplate using up 6% of the world’s remaining carbon budget from its gas resources alone. The gas just has to stay in the ground. The BGS estimate of a giant shale gas resource is not a green light for shale gas development: it’s actually flashing red. Here’s Professor Kevin Anderson of the Tyndall Centre explaining this in more detail. Of course, the UK is not the only place caught in a contradiction between ambitious emissions targets and the desire to develop unconventional gas resources. British Columbia has huge unconventional gas resources, but no continental markets. The province is promoting the development of several liquefied natural gas plants to export gas across the Pacific to Asian markets. This development will blow past its own legislated emissions targets. See also reports by the Pembina Institute and The Tyee newspaper. President Obama is also sending out contradictory messages by saying things like “We’re not going to be able to burn it all” while at the same time pursuing his “all of the above” energy policy, which has seen an enormous unlocking of America’s unconventional oil and gas resources. A new paper by McGlade and Ekins (it is paywalled, see the Carbon Brief article) reports that to avoid 2ºC warming by 2100 will require us to leave half of the world’s carbon reserves in the ground. Note that they say reserves, not resources. Resources are much bigger and are the category that shale gas outside of N America is lumped into. The study estimates that about 80% of the world’s unconventional gas resources will be unburnable. The BGS Bowland Shale gas-in-place estimate of 38 trillion cubic metres (Tcm) is not included in the quoted global unconventional gas resource total of 300 Tcm quoted in the paper. Done carefully on a small scale in selected locations, shale gas exploitation probably can be done with tolerable environmental impacts. And replacing coal with gas will reduce emissions a little, if not nearly by as much as is needed. However, even if we accept that shale gas development done in careful, small doses could be acceptable, the massive quantities involved in developing projects of the scale envisaged by the promoters make the sum of the effects unacceptable. Governments and big business are excited about developing shale gas precisely because they recognize the potential to make a significant difference to their revenues. But they downplay or ignore the cumulative impacts: both on the communities who live above the resource and on greenhouse gas emissions. The pressure to develop shale gas is intense enough even now, but it will only grow. Once the geological uncertainties are reduced, the resources will start to appear on corporate balance sheets. Once the production starts even on a modest scale, precedents will have been set and infrastructure capital will have been sunk. Momentum will build. This is not a bridge to a low carbon future so much as the corporate camel asking to stick its nose just a little bit inside the tent. The title of this piece is a quote attributed to Stalin when referring to the huge but poorly equipped Red Army during the Second World War. It’s probably apocryphal, but I like it anyway. I beg the reader’s indulgence for the use of A Day in the Life lyrics for the subtitles. This entry was posted in Uncategorized and tagged BC, Emissions, Fracking, LNG, UK. Bookmark the permalink. Terrific, thanks. Did you mean Buckland or Bowland (your link, first mention)? Buckland makes me think of Dartmoor.